MOOD Australia™ Studio began with the design and production of a unique range of quality, hand-crafted gifts for men in 2001 by principal Steven Marando. 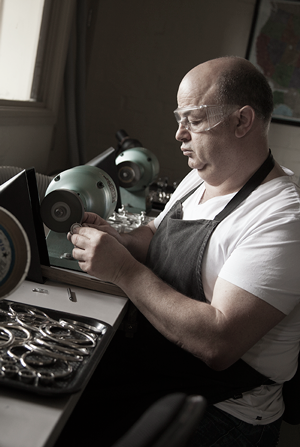 The Sydney studio and workshop draw on the legendary design clout of Steven’s European heritage to produce a range of custom-made cabinet handles, knobs and pulls for the local and international market. In 2015, MOOD focussed on refining its ‘look’ and adapting its dynamic house-style by presenting ranges of signature and custom-made architectural hardware for private clients, the luxury hotel market, and high-end retail environments. The Studio ethically sources imported and local ‘green’ materials like leather, horn and bone in the production of our ranges, and proudly supplies to clients all over the world in including HONG KONG, USA, EUROPE, UK and NZ. The vision—to provide an outstanding service that offers distinguished boutique cabinetry ornamentation for urban living, without compromising integrity. MOOD Studio celebrates the creative process and we look forward to consulting with you soon.